Claus had come on a ten-day vacation to Kerala with his family and took a small break to interact with the local chefs. The Dane had established his reputation internationally when he founded the New Nordic Cuisine along with several Scandinavian chefs. For long, the Danes would ape Spanish, French and other European cuisines. But Claus said that Danish cuisine should consist of local and seasonal vegetables and follow the agrarian traditions of the country. When many chefs adopted this philosophy, a new cuisine was born. Later Claus, along with chef Rene Redzepi set up a restaurant in London called Noma (short for ‘Nordisk Mad’, the Danish words for Norwegian food). It received two Michelin stars and was voted the best restaurant in the world in 2010-12, and 2014 by Restaurant Magazine. Claus’s role has been different. He has been the entrepreneur, ideator, visionary, the man who brings in the money and sets up the team. Apart from being an entrepreneur, he has been a successful cookbook author, TV host, associate professor ( Department of Food Science, University of Copenhagen), as well as a social worker. Nambiar breaks into a smile. He is in a happy mood because on the centre table, there is a just-released book of over 1500 pages. It is a Japanese-Malayalam dictionary. And it is the culmination of a 15-year effort by Nambiar. The stats are mind-numbing: there are about 6 lakh words in it. The book has 53,000 headwords. Each headword has the equivalent of eight to ten words. Initially, he was writing it by hand and over the years the number of foolscap pages, which comprised the manuscript, reached an astounding 3000. After it was over, he approached several publishers in Kerala but they rejected it, saying they did not have the necessary Japanese fonts and the possibility of sales was poor. Undeterred Nambiar flew to Tokyo in 2004 and met two professors, Jun Takashima and Makoto Minegishi at the Tokyo University of Foreign Studies. The duo was producing software for linguistic studies. “They were flabbergasted when they saw the size of my manuscript,” says Nambiar. Then Nambiar received a blow. They told him that the Japanese dictionary which he had been using for reference was 60 years old. “It was outdated and the language had changed considerably,” he says. “So they suggested that I should start all over again with a new dictionary. They promised all help.” So Nambiar began once again and after seven-hours workdays, for years, the 81-year-old completed it. And on March 8, at a function in Thiruvananthapuram, Culture Minister AK Balan handed the first copy to Hideki Asari, the Minister and Deputy Chief of Mission of the Japanese Embassy in New Delhi. “This is a new era in the relationship between Japan and Kerala,” said Asari. The book has been published by the State Institute of Languages Kerala, in association with the Tokyo University of Foreign Studies and the Research Institute for Languages and Cultures of Asia and Africa. Nambiar’s association with Japan began in 1965 when he won a scholarship to do a doctorate in oceanography at Tokyo University. Since the language that would be used would be Japanese, he spent six months learning it at the Osaka University of Foreign Studies. Duly proficient, he completed his doctoral studies and returned to India in 1969. Thereafter, Nambiar again went to Japan as Resident Director of the Marine Products Export Development Authority in 1981 and remained till 1985. These two visits made Nambiar fall in love with everything Japanese. 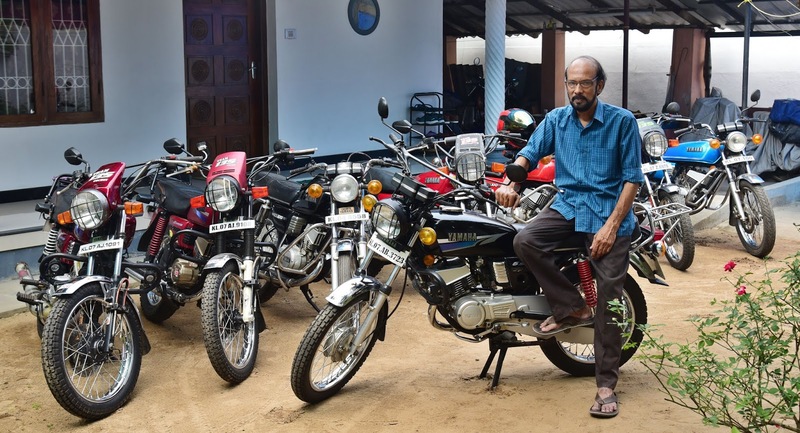 He began writing a series of articles about Japan in Kerala’s leading newspapers and magazines. Nambiar also translated the late Nobel Laureate Yasunari Kawabata’s ‘Sound of the Mountain’ into Malayalam. 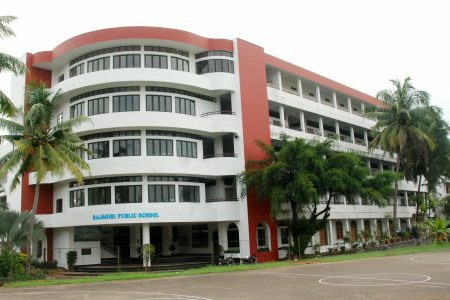 When he retired, at age 63, after a distinguished career, which included stints at the Council of Scientific and Industrial Research, the Indian Council of Agricultural Research, the Kerala Government Fisheries Corporation (as managing director), and the Food and Agricultural Organisation, he felt he should not relax. So, he started work on the dictionary. There are some words that are similar. For example, the Japanese word ‘thumbo’, is similar to the Malayalam word, ‘thumbi’ (dragonfly). In Japanese, the meaning is the same. 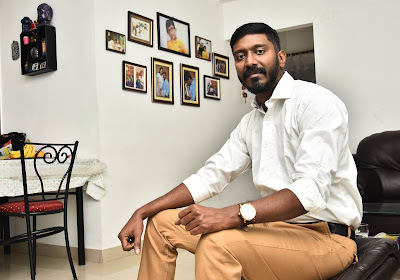 “There is a theory that the Japanese and the Dravidian languages are interlinked but so far, no concrete proof has been uncovered,” says Nambiar. 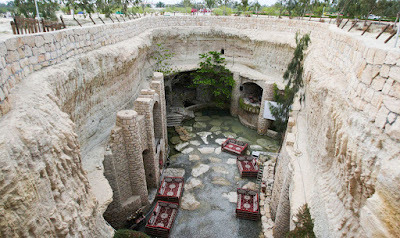 Ssshh… let’s go to Kish! 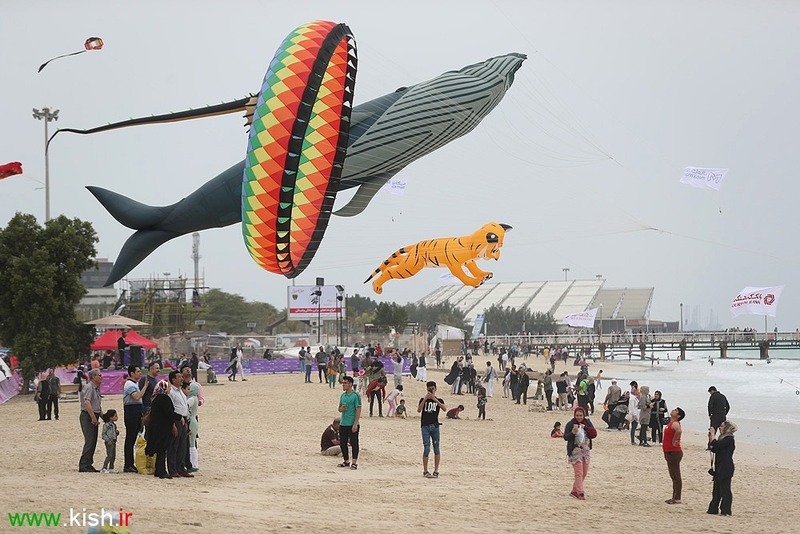 When the Aluva-based kiter Rajesh Nair was invited by the Mica Group of Companies in Iran to participate in a kite festival he felt very excited. But when they told him it would be held on Kish Island, he scratched his head. ‘Where is it?’ he thought. He googled it, and came to know that it was near Iran’s Hormuzgan Province in the Persian Gulf. It is a one-and-a-half hour flight from the capital Tehran to reach the island. But to reach Tehran from Kochi takes 11 hours. 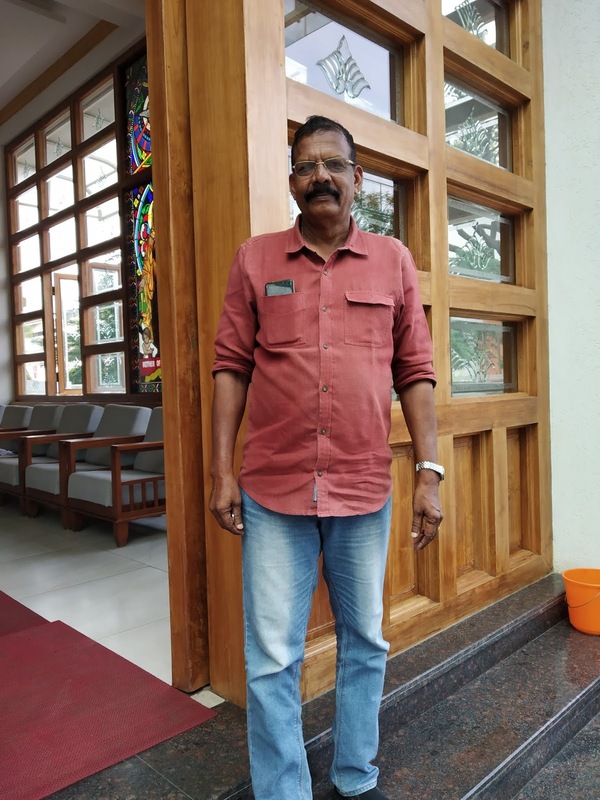 Rajesh called his Dubai-based friend Uttam Kumar, who is also an organiser of kite festivals, and the latter quickly gave some reassuring news: it takes only 40 minutes to reach Kish from Dubai. What also made it easier was the fact that India, along with a few other countries is in the ‘No Visa’ category. So last month, Rajesh flew to ‘Kish’ (which means creed, belief or religion and is the name of an ancient city in Persia). On the flight, he noticed several Malayalis. He was told later that they they were working in the hospitality industry as well as on the different oil rigs near the island. The population of the 80-km long island is 30,000 but the number of annual visitors is 15 lakhs. These include tourists from Denmark, USA, Russia, Saudi Arabia, the United Arab Emirates, Qatar, Kuwait, and Afghanistan. The currency is the Iranian rial. For one rial, you get Rs 42. Surprisingly, you cannot get the currency at the Kochi airport. “But the problem with the rial is that you have to spend it all in Kish,” says Rajesh. “So, it is better to take American dollars.” Incidentally, Kish is a Free Trade Zone. Some of the other attractions include jet and water skiing, parasailing, paragliding and snorkelling. Then there is the Dolphin Park, which has 22,000 palm trees, in an area of 170 acres. Apart from dolphins, you can see whales and sea lions, Other attractions include a butterfly garden, an artificial rain forest, cactus and orchid gardens. In the Ocean Water Park, you can enjoy 13 rides and go swimming in four pools. There is also a thousand-year-old underground city called Kariz which was an ancient underground aqueduct. It’s most arresting feature is the numerous wells, with a diameter of 50 feet and a depth of 300 feet. “All these wells are inter-connected and look very impressive,” says Rajesh. There are numerous shops and restaurants where you can enjoy Iranian food. The cuisine is tasty. The Iranians use almonds, walnuts and dates in their food, which includes rice, different types of fish, and meat -- ham, lamb, mutton, and chicken. What is a surprise to know is that Kish is the third-most popular vacation spot in South-West Asia after Dubai and Sharm-el-Sheikh (Egypt). Meanwhile, the kite festival was the first of its kind on the island. There was a huge kite, 80 feet long and 30 feet wide. Made by one of the foremost kite-makers in the world, Peter Lynn of New Zealand, it was in the form of a Manta Ray fish. The kite, which is owned by kiter Mehmet from Turkey, was tied to some sand bags. But suddenly, a fierce wind began. The kite, which weighed 750 kilos, broke away. As it rose, it got stuck in a tree. “In the end, a branch had to be cut, to bring down the kite,” says Rajesh. The normally-unflappable Pavneet Pal Singh is gasping. 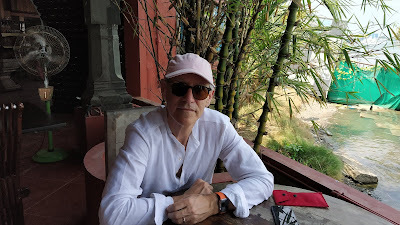 “It’s really hot,” he says, as he walks around the almost deserted grounds of Aspinwall House at Fort Kochi. 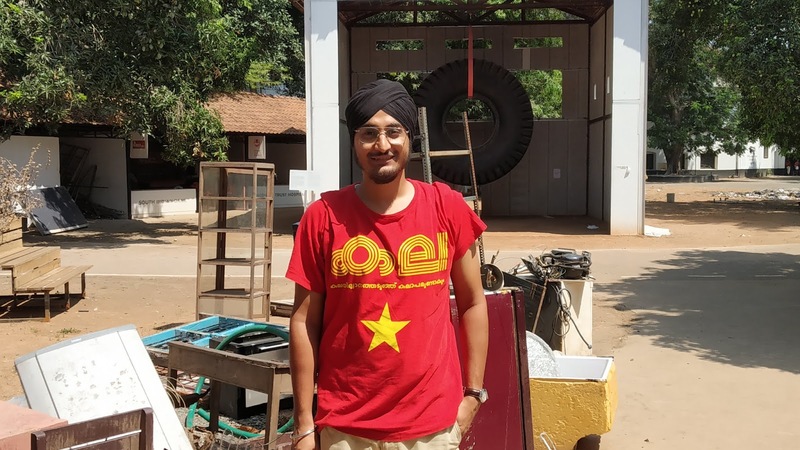 As the head of production for the Kochi Muziris Biennale (KMB), he is supervising the deinstalling and packing of all the artworks following the conclusion of the art festival on March 29. 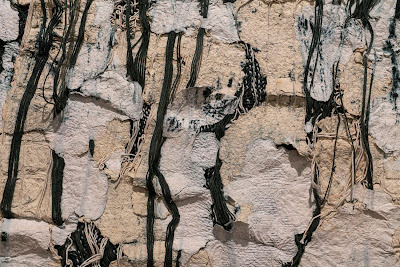 “Deinstalling is basically removing it from the walls, or dismantling the installations,” he says. 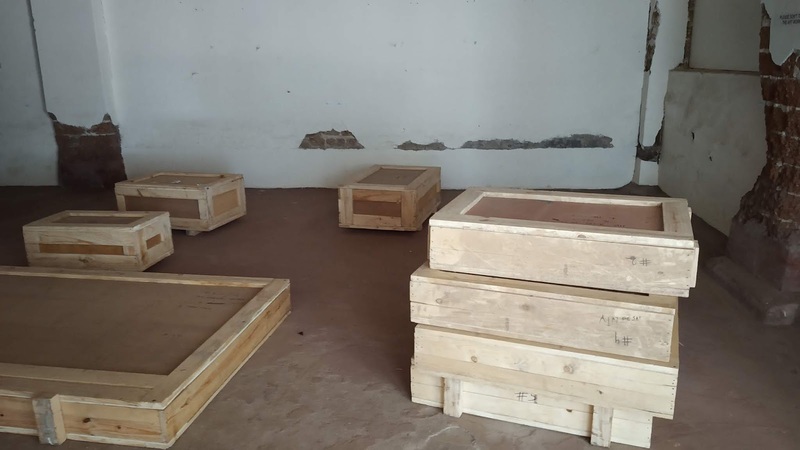 “If there is a big painting, we place it on a layer of foam.” Following that, a team of packers will put it in crates, the same ones in which the artwork was brought to Kochi initially. They had been all numbered and stored in a warehouse. The team of volunteers is following a schedule that has been drawn up by the KMB. “We have de-installed the works of four or five artists every day for the past two weeks,” says Pavneet. After it is put in crates, it is sent by lorry, train, plane or ship to cities both within and outside the country. However, not all artworks have to be shipped back. The Chinese artist Song Dong’s installation, called ‘The Water Temple’, a glass structure, placed on the grounds, was built on site. Bangladesh artist Marzia Farhana’s work on the devastating Kerala floods in August last year featured refrigerators and television sets that no longer work, as well as books that were damaged by water. “We bought Marzia’s objects as scrap and it will be sold as scrap,” says Pavneet. Meanwhile, a couple of photographers of the KMB are going around taking photos of the artworks just before they are packed. The reason for doing this is simple: if there is any damage to the art works during transit, the transporter can be held accountable. At the moment there are a total of 29 volunteers: 15 are at Aspinwall House and other venues, two at Pepper House while the rest are at the Students’ Biennale. Interestingly, only one artist among the 94 has personally come to do the packing. She is Lubna Chowdhary from Britain. Her work, ‘Metropolis’ contains one thousand small ceramic sculptures of household items like a telephone, wheelbarrow, table, chair, and clock. “Lubna felt it was easily breakable, so she wanted to do the work herself,” says Pavneet. “In the end, she took three days to pack the entire lot.” However, some, like Shilpa Gupta and Kausik Mukhopadhyay sent their assistants. Interestingly, South African artist William Kentridge’s installation had eight video screens. But they were made locally, of gypsum board and aluminium. However, the two big megaphones on tripods came from South Africa and media players from the Netherlands. “So we will be sending them back,” says Pavneet. It was pitch-dark. The Thrissur-based artist Rijo AR was walking along a highway in Rajasthan in early March with a rucksack on his back. He had put a small battery-powered light at the back of his bag, so that he would not get run over by a vehicle. But the road was deserted. Suddenly, he heard the ‘thud thud’ sound of a motorbike. Instinctively, he put his hand out. The bike stopped. Rijo saw that there were two men on it. But they looked drunk. But they didn’t. They came forward, pointed at the light and said, “Do you have a bomb? Are you a terrorist” Rijo shook his head and said, “I am an Indian.” He showed his Aadhar card. But the men did not look at it. Suddenly, one of them punched Rijo on the face. “I fell on my back and could not breathe for a few moments,” he says. “They grabbed my bag and shouted ‘We have to check it’.” The road had a divider. Rijo managed to grab his bag back and ran to the other side. He walked rapidly. The duo followed on their bike. Thankfully, luck smiled in Rijo’s favour. At some distance away, workers wearing L&T (Larsen and Toubro) uniforms were flashing lights. The road was being repaired. Rijo ran and stood beside them. He tried to communicate but in his fearful state, no words in Hindi came out. It didn’t help that they did not know English. Suddenly a van came up to collect the men. There was an officer who knew English. Rijo told him about what had happened. He shouted “Get in.” Gratefully, Rijo clambered into the vehicle and made a timely escape from the area. Rijo was on a random journey. After meeting with some friends in Bharuch, Gujarat, he decided he would hitchhike his way back home. But when he reached the highway, he saw two signboards. If he went right, the road would take him to Mumbai, Goa and Gokarna. If Rijo went left it would lead to Rajasthan. “Without any planning, I went left,” he says. Rijo walked for a long time. His mind was blank. But after five kilometres, somebody bought him a bottle of mineral water. Soon, he thumbed a ride. And his journey had begun. When he neared Mount Abu Road, in the Sirohi district of Rajasthan, a man by the name of Raghav picked him up. He was the principal of a local school. Raghav took Rijo to a temple, which is dedicated to Lord Shiva. There is a stone sculpture of Nandi the bull. While there, Rijo took part in rituals, and poured milk on the lingam. At night, Raghav took Rijo to an ashram. The Malayali was shocked to see it was full of tribal girls in the 15-year age category. “They live in the forest but come for four months to study and enjoy free food and lodging,” says Rijo. Later, Rijo travelled to Ajmer, Pushkar, and Jaipur. It was in the Pink City that he put up a sign on the back of his rucksack: ‘All India Trip without money’. 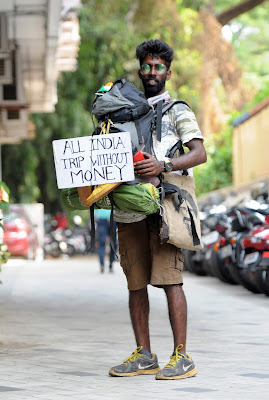 Later, he went to Gurugram, Delhi, Chandigarh, Kulu, Manali, the states of Andhra Pradesh and Telangana, Chennai, Mahabalipuram, Bangalore, Mangaluru, Kasaragod, Kannur and Kochi, a total of 46 days. Everywhere he went he depended on the kindness of strangers for food, shelter and travel. In most places, he would put up a tent and sleep inside it. At Kochi, a couple of days ago, Rijo looks thin and weather-beaten. He is experiencing pain around his neck, arms, legs and has blisters on his feet. 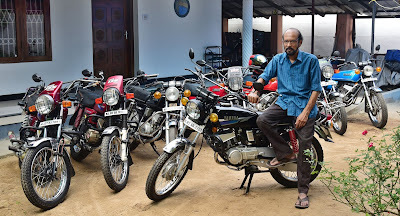 Rijo is now on his way to Kanyakumari where he will bring his trip to an end. The 24-year-old, who has a diploma in hotel management, is yet to decide on the future course of his life. But at this moment, he is trying to assimilate the numerous experiences he went through. “There are all types of people in this world,” he says with a smile. There are several routes: the buses go towards Tripunithara, Kakkanad, Aluva, Angamaly, Paravur, Kadavanthra, Elamakkara, Thoppumpady, and Mulavukad, among other places. 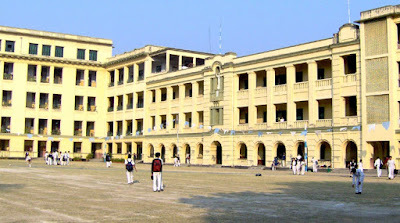 Since the buses are owned by the Higher Secondary (HS) section, Fr. Rector Bijo Kannattukalathil, of the HS section, retains overall responsibility. He works closely with Peter and the drivers. Fr. Bijo has an app so he can monitor the movements of the buses. Interestingly, the majority are auto-rickshaw drivers who own their vehicles. “So, till the time they have to return at 3 p.m., they are busy taking customers here and there,” says Peter. The buses leave the campus by 3.25 p.m. and they return to the Kalamassery campus, by 4.30 p.m. Those who drive the Thevara and Aluva buses, which are parked in those areas, also live in that area. “That way, the drivers don’t have to travel very far after their work,” says Peter. Not surprisingly, the most difficult season is the monsoons. “Traffic slows down because of waterlogged roads, and in places like Vytilla, where the flyover construction is taking place, you can get delayed,” says Peter. As for the 25 women helpers, apart from assisting in the buses, they keep the classrooms and the campus clean. Peter, on the other hand, has to oversee the security of the campus. So what is being taught? “For example, after the children and teachers get in, the driver or the helper has to close the door before the bus can leave the stop,” says Peter, who had been a Sub Inspector of Police for 33 years, before he retired in 2011. 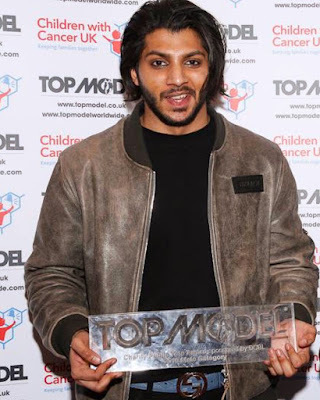 At the prize giving ceremony for the Top Model competition at the Amba Charing Cross Hotel, London, on March 24, the announcer said, “In the men’s category, it is Najath [Sharafudeen].” The Thrissur-born model stepped up and received a glass plaque with the words, ‘Top Model’ right across it, a sash and a goodies bag, even as whoops and cheers rang across the hall. He is the first Indian and the second Asian to win this national-level competition. The Top Model is one of the leading competitions in the UK. In the men’s category, Najath won in the Public Charity Award. There were 17 finalists from countries as diverse as Ireland, Spain, Africa and the United Kingdom. This is a win based on popular votes. Visitors to the web site (topmodel.co.uk) have to click on the model they like, by assessing their appearance and walk, and send money. “If you give one pound it is equivalent to one vote,” says Najath. “If you give 20 pounds I would get 40 votes and for 100 pounds, it is 150 votes.” Voting took place over five months. In the end, Najath received 2,000 votes and earned 1,300 pounds. The money has been given to the ‘Children with Cancer UK’ organisation, which is the leading charity in Britain for childhood cancer. Incidentally, this is not the first prize that Najath has won. At the British School of Fashion, where the 24-year-old is studying brand designing, there was a ‘Reworked white shirt’ competition. Plain white shirts were given to students and they had to design it in a creative manner. And Najath again walked away with the first prize. The youngster has a clear aim. “My dream is to create a fashion brand in India based on British designs,” he says. In Britain, when the men go to work, they use three types of material, when it comes to white shirts: poplin, herringbone, and Oxford. These are formal shirts and are 100 percent cotton and non-iron. As for the fittings, there are four types: super-fitted, fitted, slim fit and regular fit. But when they go for dinner, the style is different. “Then the men will have V-cut collars, cufflinks, and dress studs, instead of buttons,” says Najath. Because the climate is very cold now, the ladies wear cardigans and trenchcoats while going to a party. 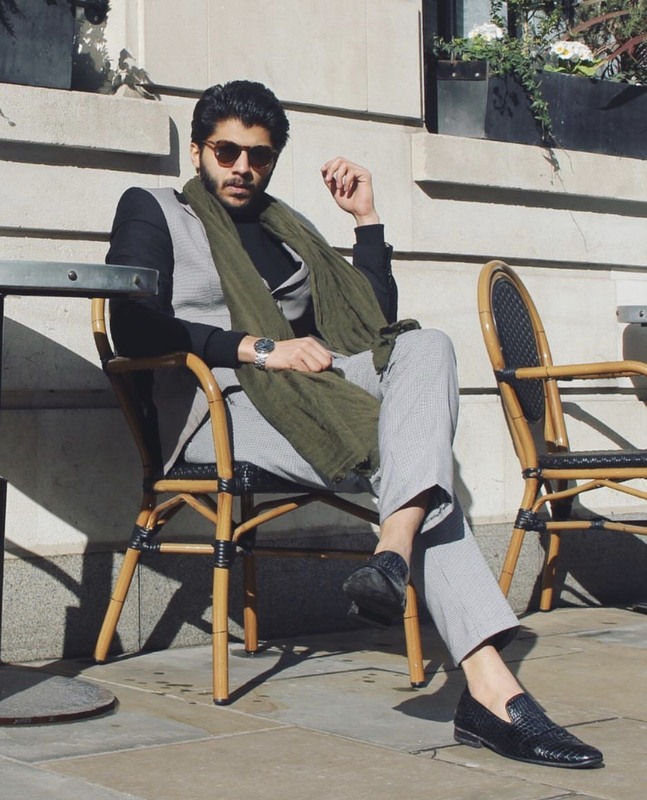 “Once there, they will take it off, since most places are centrally heated,” says Najath, who is learning how different Britain is from India. It was a routine biopsy. The boy was one-and-a-half years old. He had a swelling on his face. It looked like a tumour. At the Nomo Children’s Hospital at Sokoto in Nigeria (750 kms from Lagos), Dr James Jesudasan, a Chennai-based maxillofacial surgeon, stood poised over the boy with a scalpel in his hand. On either side of him were his colleagues Julia Amando of Brazil and David Shaye from the USA. James paused and, inexplicably, tears began to roll down his face. Julia nodded and did the biopsy within two minutes. James was in Sokoto at the behest of Médecins Sans Frontières (Doctors Without Borders), the international NGO that works in conflict zones and in countries affected by epidemics. He was there to deal with children who had been afflicted by a disease called Noma. It is a bacterial infection which occurs because of excessive malnutrition in poverty-stricken countries. It starts off with a blister in the mouth which develops into ulcers. Soon, the tissues degenerates. When this happens, the surrounding tissue gets hardened. As a result, the jaw gets locked and eating becomes very difficult. 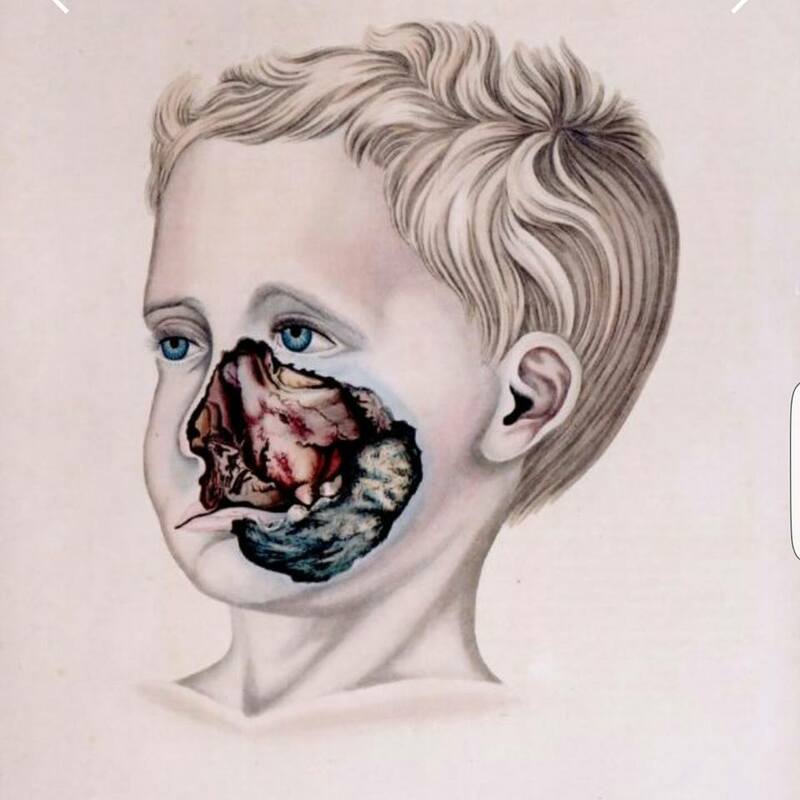 A huge opening is formed in the area of the nose and mouth. 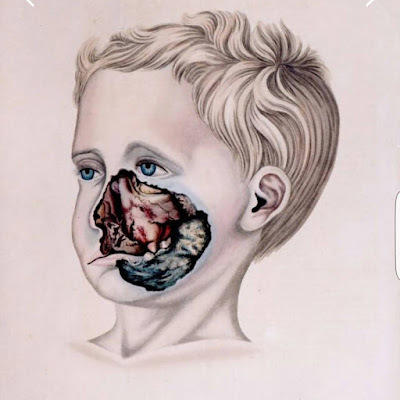 So James’s brief was to repair faces, restore dignity, and unlock jaws so that the children could start eating again. It takes years before some semblance of normality can be brought back to the face. But what brings joy is to know that the children can start eating. For a long time, they only had gruel. “Since it is a meat-eating society, the children have told me that one of the first things they will eat is chicken,” says James. Not surprisingly, they are extremely grateful. On his last visit, in October, they prepared a poster, titled ‘James’ at the top. Then they made circles inside in which they drew stars, heart emojis, and butterflies. Pressing on each drawing was the child's thumb impression in red and their names. “I was moved,” says James. So, in order to create awareness, on November 19, MSF held an International Noma Day in the federal capital of Abuja. “Hopefully, government funding will start flowing to the affected areas,” says James. This can be achieved through reading, inner reflection and engagement with society. 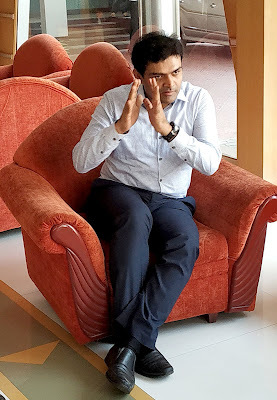 In his 16-year career, Vijay has mentored a cross-section of professionals from all over Asia: judges, CEOs, leaders of Fortune 100 companies, civil service officers, women corporate leaders, teachers, and students. 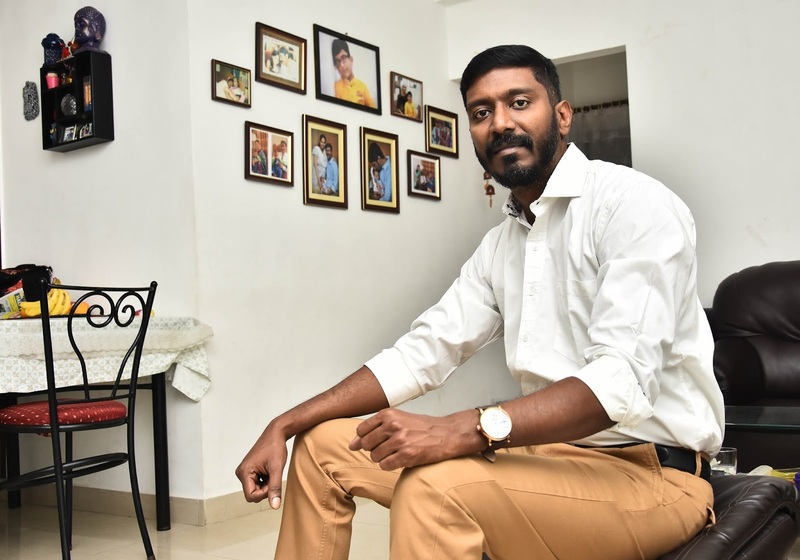 “What I have discovered is that nearly all of them have a deep desire for self-development on the personal and professional fronts,” says Vijay. This can be seen soon after the conclusion of an event. People will come up to Vijay and ask for some book to read. “When I meet them the next time, they will tell me they have read the book,” says Vijay. For Vijay, one of the books which made an impact on him was the late President APJ Abdul Kalam’s ‘Transcendence: My Spiritual Experiences with Pramukh Swamiji’. 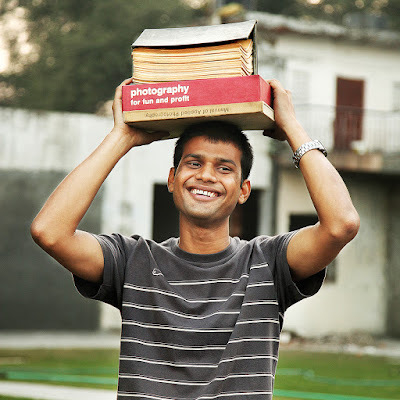 “The book says that if you have the right purpose, the possibilities are infinite,” he says. Vijay also tries to increase the possibilities of his participants. Two years ago, he was talking to a group of Class 12 students at a school in Kochi. They told him that they would be going for an excursion to Mysore. Vijay spoke to them about how money is important and it should be spent carefully. Then he began speaking about tribal colonies in Wayanad, where in summer they go through a harrowing experience because of lack of water. The talk had an impact. A group of 12 students decided to forego their trip and used the money to build a well in a village at Wayanad. “Today, they have a well which benefits 45 families,” says Vijay. Later, students from seven schools set aside money and 25 wells have been built. Thanks to his numerous interactions, Vijay has a different perspective on people, who normally do not have a good image, like public sector employees. He has addressed the managing directors of many public banks, as well as trained the chairman and managing directors of all the seven public sector insurance companies in India. “What I found was that, despite all the constraints, like lack of autonomy, some of the things that they have done are absolutely amazing,” he says. When I saw my class teacher or did I? The other day when I was riding down a road, on a two-wheeler, near my home in Kochi, in the distance, I saw a woman who had bobbed hair. I felt a sudden queasiness in my stomach. ‘Was that Miss Edmonds? (name changed)’ I thought. 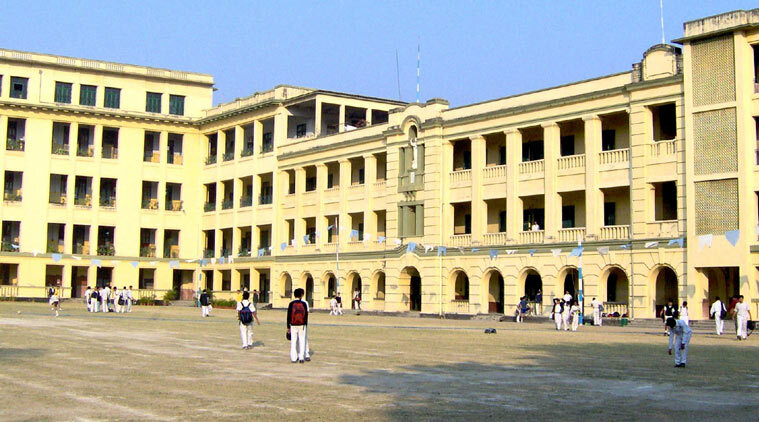 Miss Edmonds had been my Class four teacher at St. Xavier’s School in Kolkata. She was a strict disciplinarian. When Miss Edmonds walked, she looked neither to the left nor the right. When she got angry her voice sounded like a clap of lightning. And one day I got to experience her rage first-hand. It was an English class. Miss Edmonds looked at me and said, “Come here.” My heart started beating fast and my hands began to shake. I got up from the fourth row and began to walk, as if through quicksand, towards her table. I stopped and waited. There was a pin-drop silence in the class. “Then why did you submit your book?” said Miss Edmonds. I did not know what to say. It was my fear of the class teacher that made me do so. Miss Edmonds pulled out the gold ring from the third finger of her right hand and placed it carefully on the table. Then she pushed back the chair, stood up and in the very next instant, she slapped my face. My head rocked back. My eyes closed and I saw stars under my eyelids. There was a sting on my cheeks and, all of a sudden, tears began to roll down my face. Miss Edmonds flung my notebook towards the door. “Go and stand outside till the end of classes today,” she shouted, as I numbly walked towards the door. I could feel the eyes of all the boys on my back. Outside, I wiped my face with a handkerchief. It was such a shock. This was the first time in my life that I had been slapped. My mother had always scolded me but never touched me. As I came abreast of the woman on that Kochi road I looked sideways and saw that it was somebody else. Of course, it would be, since Miss Edmonds died more than fifteen years ago. Sadly, some fears do not go away. They remain alive and kicking till you die. The afternoon sun is blazing. So, it’s no surprise that even though Glenn D Lowry, the director of Museum of Modern Art (MoMA) in New York is sitting in the shade of a shore-side restaurant, at Jew Town, he is wearing sunglasses. The reflection of the water can get a bit overwhelming, especially if you are not used to such tropical heat. But he is also smiling because he’s had a good time at the Kochi Muziris Biennale. 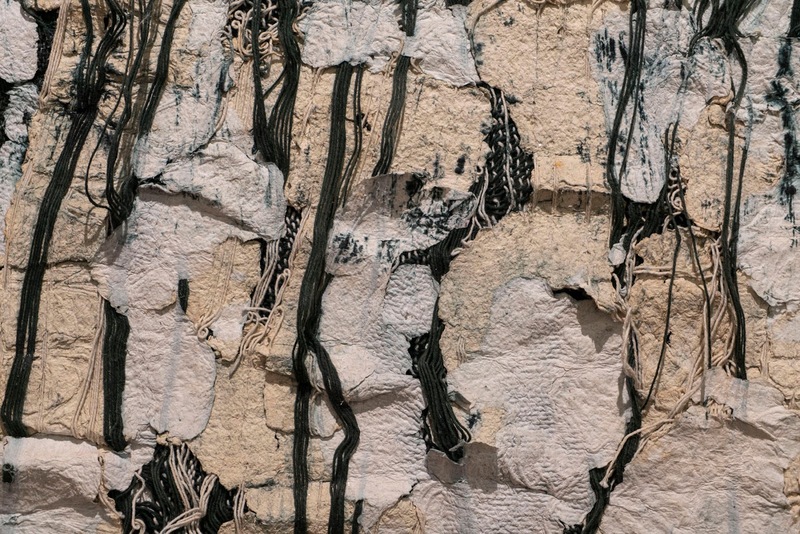 MoMA in New York also provides access to top class art for all types of people. They have an astonishing 30 lakh visitors annually. But, interestingly, there are a few works that people see time and time again. These include Pablo Picasso’s ‘Les Demoiselles d'Avignon’, Vincent Van Gogh's ‘Starry Night’, Jackson Pollock’s ‘One: Number 31’, 1950’ and Henri Matisse's ‘Dance’. At 7.30 a.m., on a recent Saturday, inside the large shed of the Dakshina Bharatha Kalari, at Fort Kochi, Mereena Aswani gazes at the women standing in front of them. All of them are wearing black: T-shirts, track pants or salwar kameez, with a red sash tied around their waists. Soon, they raise their hands upwards, move forward, kick their legs up, turn around, move forward, and kick their legs up again. Later, they sit cross-legged on their floor and Mereena guides them through a series of arm-stretching exercises. For years, Mereena had been assisting her husband, kalaripayattu exponent Aswani Kumar, but on March 8, Kochi Mayor Soumini Jain inaugurated classes exclusively for women. 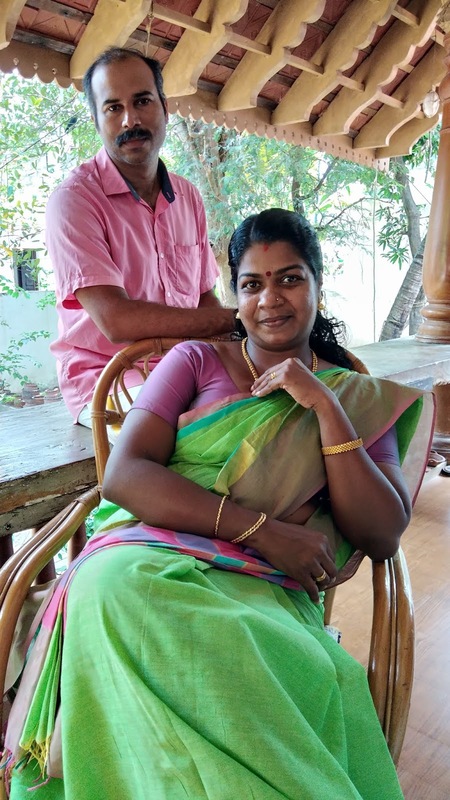 “It was a desire of my teacher, Sreedharan Gurukal to start a Kalari exclusively for women and I have achieved that dream, with the help of Aswani,” says Mereena. In fact, the duo got a shed constructed, with a mud-pressed floor, while spears and shields hang on the walls, which have been painted in red. At 1200 sq. feet, it is a spacious area. Once the local women came to know about the classes, they have stepped forward enthusiastically. There are Gujarati working women, ladies from the Muslim community, professional dancers, who want to strengthen their legs, homemakers and yoga trainers who want to learn a martial art. “The flexibility in yoga is different from the flexibility that you gain from kalaripayattu ,” says Mereena. Interestingly, Mereena has been burning away this negative energy for decades. It all began when she was only ten years old. Because of weak legs, she would fall down often. So, the doctor who treated her told her parents that one of the ways to develop strength in the legs was by practising a martial art. For the family, this was an easy choice. 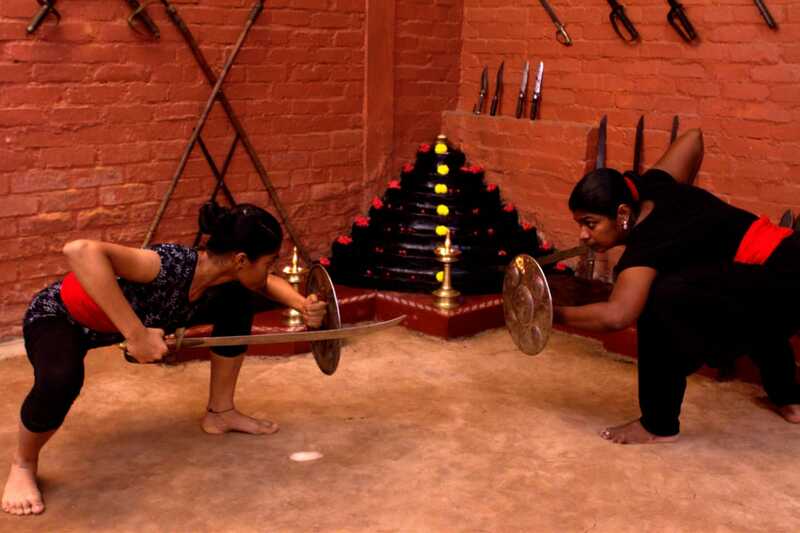 Just two houses away, at Fort Kochi, was the master Sreedharan Gurukal who used to hold kalaripayattu classes. So Mereena was enrolled. Usually, she would come to the courtyard every day at 5 p.m., after school was over, for training along with a few ladies and girls. “I was the youngest in the group,” she says. And over time, as she practised regularly, her legs became stronger and the pains went away. Kalaripayattu has other benefits, too. Before entering the kalari (ring), the kalaripayattu artist touches the ground with his hand. Thereafter, he or she touches the feet of deities like Ganapati and Bhadrakali, at the different corners of the kalari. Then you have to touch the feet of the guru. “Through these acts, you become humble,” says Mereena. Apart from kalaripayattu, Mereena also teaches yoga. Last year, she had gone to Germany to teach yoga. At the kalari, Mereena gives a body massage for those who have body aches and pains. Through all this Aswani is right next to her. The couple, who tied the knot on April 30, 2005, has two school-going daughters.